This last week has made me so incredibly thankful for all that we have been through to become a breastfeeding mama and bubba. I know there have been people who have doubted it, people who have thought that my passion to continue through it all, to find a way among the madness for us to somehow have this relationship, was entirely nonsensical, obsessive, ridiculous and potentially even damaging. And heck, I have obviously had my doubts too, never sure if I was doing the right thing, trying so hard to continue to see the big picture and ensure that the blinkers of my tunnel-visioned-stubbornness remain off. But I know now that it was all worth it. do it in such a distractible environment! My Little One has been sick. He stopped eating and his fevers reached 40 degrees. He became incredibly unhappy and listless, sleeping almost constantly, and crying when not. I breastfed as much as possible, and yet his nappies were nearly empty. He was sweating like crazy, losing a lot of fluid. He was biting me again – I now know that this is a clear sign that he is sick – but I just had to keep offering. He was going six hours without any pee. No matter how much he fed, he wasn’t staying hydrated enough. I didn’t have enough milk for him to be an exclusive breastfeeder in that way. I fed him tea and water from a cup, from a bottle, from a spoon. 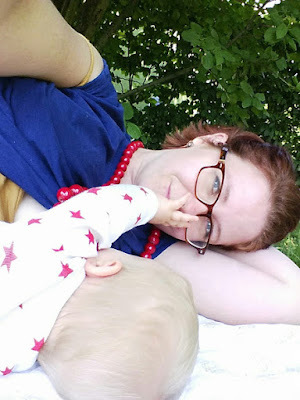 The biting was always the worst just after I had given him medication, I learnt, so that was always where I offered some sips of water from a bottle first, and then my breast. I had flashbacks to feeding my first boy when he was sick. 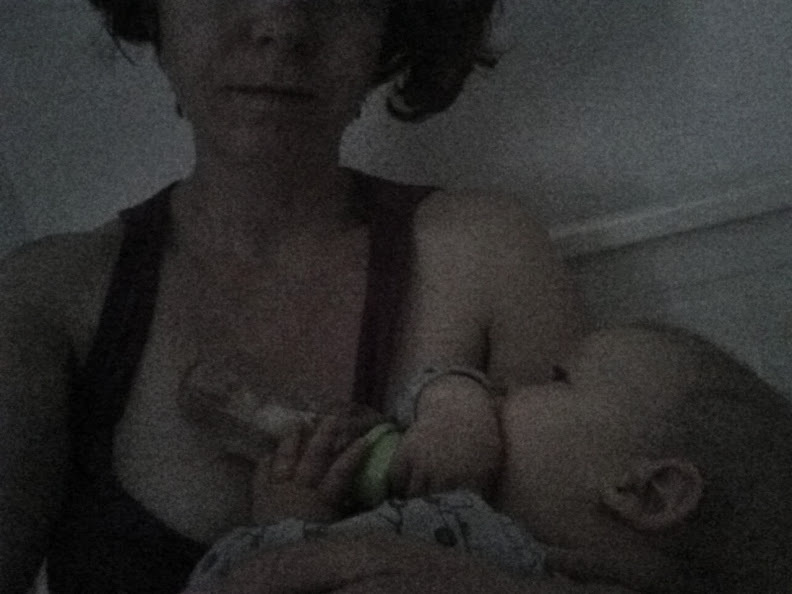 I have never given The Little One a bottle before, and yet at 3am, there I was, cradling a sick little baby in my arms in the dark, his head against my chest as he sleepily sucked at a bottle (though this time with tea, not with formula). It was nice. That surprised me. At the doctor, he had a blood test. He was sleeping when we arrived, so I gently took him out of the carrier and put him to my breast. They pricked his finger and squeezed out the blood, and he barely flinched. ‘Wow!’ the nurse said to me. ‘I might just ask every breastfeeding mother if they could feed their baby during a blood test, that’s amazing!’ I was surprised that more mothers didn’t do this, as it was my first instinct when I knew that my boy would be in pain. 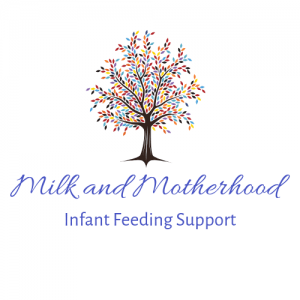 She said that they get every single kind of mother in their offices, and that it is very rare for a mother to feel comfortable enough to breastfeed outside of the private rooms and in the public space where they do the blood test. That amazed me; surely if a mother knows it will stop their baby from screaming and screaming in pain, they would? But she said no, you’d think so, but no. So now I’m on a mission to breastfeed my boy in those offices any time in the hopes that more mamas will feel comfortable doing so! He then needed more tests, some attempts at catheterisation, and finally a bag attached to him to collect his urine. I just nursed and nursed and nursed my little boy through the whole thing. At one point, we had to take him from me to weigh him, and he screamed that kind of scream that makes a mama die inside. The kind where his mouth was open, his eyes screwed tight, his face almost purple, and yet no noise was coming out. Until it did. And goodness, it did. Straight back to my breast. To know that this is how he reacted even when he was in a situation where no pain was being inflicted on him made me so thankful that I could breastfeed him for every other scenario. So that’s really all it comes down to. 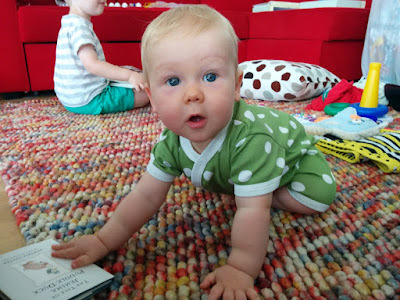 I didn’t have enough milk, yet again (I got my period, which is potentially also to blame… there’s another post!). But that’s not what this was about. This was about comfort. All that we have been through together has allowed us to now be capable of getting through such days. I absolutely love that he can receive that from me, that I can mother him in this way. I have a magic power that will make it all better.